1. Do your homework on the employers you’re interested in. Make sure to create a top 5 list and tailor your resume for those employers. 4. Be energetic! Employers love students who are enthusiastic and excited to talk about their company. Be sure to brush up on your communication skills! With these tips and the right preparation, you can have a successful experience at the Spring Career + Internship Fair. Remember, the career fair is a chance for you to showcase your achievements and make an impression so be sure to do your research and be prepared! For more help with resume editing and elevator speeches, visit the Career Center on the 2nd floor of WPU. 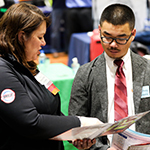 The engineering fair will take place on February 12 from 11 a.m. – 3 p.m.; computing and information will take place on February 13 from 11 a.m. – 3 p.m.; and Liberal Arts, Science, and Business will take place on February 15 from 11 a.m. – 3 p.m. For more information, check out handshake. Good luck!